In 1979, as fate would have it, I landed at the University of Hawaii at Manoa. Little did I know the profound influences that would affect my life. I hear rumors as I begin my first-year art foundation studies in the Art Department. Purportedly, there is a professor in the department who is, by all accounts, larger than life. This professor is away on sabbatical as I begin my studies and... Read more. Every medium has its appeals, its fascinations through its materials, its manipulations, and the way results are achieved. The artist's temperament naturally gravitates to some of these appeals more than others. I, for one, have never found a medium lacking in appeal or failing to beguile me and pique my interest to do more work. But only one medium has ignited an undying passion which after 60 years is undimmed. Why this should be so has always intrigued me. Intaglio printmaking is a slow complicated process utilizing an intractable material (metal) and only, indirectly providing the resulting print. Why it should have captivated my imagination from the first is only comprehensible when one considers the exhilarating moment when the print is removed from the plate--a miracle is born! The glistening black, upraised lines, the velvety dark and mysterious areas are alive, beautiful and suggestive. Every print from every plate recreates this magical moment. To be satisfying a medium not only has to provide exciting results but must provide the artist with means to express his ideas both with control and flexibility. Eloquence of articulation derives from repeated reflection, reassessment and greater scope in thought and feeling. Intaglio procedures offer opportunities for reconsideration through their very complexities and the time waiting for grounds to set, plates to heat or to cool etc. These built-in opportunities compel the artist to develop a rhythm of activity and contemplation before more action. Thus work acquires greater depth richness of implication and wider appeal. The whole process extends the artist and ultimately extends the viewer as well. In addition to the lush and gorgeous surfaces of both plate and print one particular intaglio technique bears special attention: Engraving, burin engraving, in the tradition of the 16th century masters in which no acid touches the plate--only the engraving tool carves grooves for printing. This direct approach to the metal in contrast to the indirectness of acid techniques gives a special quality to intaglio prints and is the most precise and surgically exact linear drawing attack. In combination with etching techniques, engraving expands the expressive horizons while specifying particulars. Fish Head Burin Engraving 7.5 x 9.5"
Wedding Party Burin Engraving 11.375 x 15.25"
The Crowd Intaglio 16.75 x 23.75"
Pickled Wisdom Intaglio, engraving 17.75 x 23.75"
Typhoon Wave Color intalgio 23.625 x 16.625"
Black Current Color intalgio 15.625 x 23.625"
Sugar Breath and Soggy Eyes Color intalgio 23.625 x 14.75"
Un Jour L'Amour Nous Blesse Intaglio 22.625 x 11.25"
Return of The Warrior Intaglio 20.5 x 29"
Idols and Ikons Line etching 19.5 x 23.875"
Fallen Heroes Line etching 20.875 x 28.875"
Betrayal Etching 23.875 x 35.375"
The Great Escape (More Betrayal) Etching 23.875 x 35.375"
Wave Music Engraving 15.25 x 23.25"
His Highness The Rock Etching, aquatint 11.5 x 9"
Engraving Engraving 10.75 x 17.75"
Notation Intaglio 11.625 x 16.75"
Dusk, Dark Shore Drypoint 13.75 x 23.625"
Watchers Engraving 11.875 x 17.625"
Tribulation Intaglio 28 x 22"
Anguish Intaglio 21.5 x 29.5"
Pindling, Puckered and Frantic Intaglio 23.625 x 32"
Tingle For Tomorrow Intaglio 17.125 x 36.375"
Mullah's Dilemma Intaglio 16.75 x 23.75"
Big Wave at Koumishi Intaglio 23.5 x 20.875"
Beaucoup de Monde Intaglio 23.25 x 21.25"
Interrogation Intaglio 19.75 x 31.625"
Pinnacle Intaglio 35.5 x 23.75"
Silvers of Discontent Intaglio 10.25 x 29.75"
Survival Etching, aquatint 20.875 x 28.5"
Hunger for Memories Engraving 9.375 x 14.875"
La Forza del Destino Engraving 16.875 x 23.75"
Demons Engraving 11.625 x 6.625"
Death Engraving 6.625 x 12.125"
Dilemma Engraving 8 x 13.875"
Crack in the Fog Engraving 13.875 x 23.375"
Perceptive viewers will recognize Lee Chesney’s prints and paintings as familiar sights in Hawaii and abroad. 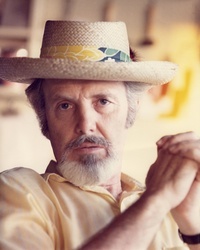 Originally from Washington, D.C., Chesney’s artistic talents have exhibited locally, nationally and internationally for over seven decades. Currently Professor Emeritus at the University of Hawaii at Manoa, Chesney also taught at the University of Southern California, the Otis Art Institute, the University of Illinois, and the University of Iowa. His repertoire of teaching experience is furthered by Visiting Artist invitations to the University of Colorado, the University of Washington, and the University of Alaska, Fairbanks. Retrospective exhibitions immortalize the breadth and amplitude of Chesney’s creative work. Beginning in 1956, the Yoseido Gallery, in Tokyo, Japan, presented a series of his prints and drawings; in 1968, the University of Southern California followed with a travelling exhibition of Lee’s work, 1977 through 1980, traversing the United States; in 1988, the Parsons School of Design in Paris, France highlighted his achievements; and the present University of Hawaii at Hilo Gallery show continues the tradition by presenting the most recent progression of his work to date. Many prestigious institutions are home to Chesney's work: the Honolulu Academy of Arts and the State Foundation for Culture and the Arts in Honolulu, Hawaii; the Oakland Museum of Art, Oakland, California; the Seattle Museum of Art, Seattle, Washington; the Otis Art Institute of Los Angeles County, Los Angeles, California; the Portland Art Museum, Portland, Oregon; the Denver Museum of Art, Denver, Colorado; the Dallas Museum of Art, Dallas, Texas; the Museum of Modern Art, New York, New York; The Brooklyn Museum of Art, Brooklyn, New York; The Philadelphia Museum of Art, Philadelphia, Pennsylvania; the Chicago Art Institute, Chicago, Illinois; the Butler Institute of American Art, Youngston, Ohio; The Hudson D. Walker Collection, and the Concora Foundation, New York, New York. International collections include The Bibliothéque Nationale, Paris, France; the Victoria and Albert Museum, London, England; Tokyo University of the Arts and the Tokyo Museum of Modern Art, Tokyo, Japan; the National Gallery of Art, Stockholm. Sweden; the Tate Gallery, London, England; and the United States Embassy, Bonn, Germany. Recent exhibitions include the Cleveland Museum of Art, Cleveland, Ohio; the Grand Opening, Hawaii State Art Museum, Honolulu, Hawaii; the 30th Anniversary of Southern Graphics Council Exhibition, New Orleans, Louisiana; and The Anniversary Exhibition of Emeritus Professors, University of Hawaii at Manoa, Honolulu, Hawaii. Return to the Retrospective Exhibition, Three Master Printmakers: Lee Chesney, Krishna Reddy, and Ken Kerslake.